. : Optics & Photonics Focus :: Much More than a Contact Lens :. A contact lens with integrated circuitry. A researcher of the University of Washington holds a contact lens which embeds LEDs and other electrical components and which is manufactured using their newly developed self-assembly technique. Imagine you are visiting a small town for the first time. Suddenly, you bump into a monument and wonder what it is. Faster than the blink of an eye, the special contact lenses that you are wearing display the name of the monument with a short description directly retrieved from the web. Science fiction? Not for much longer. Contact lenses which look exactly like ordinary contact lenses, but with a LED display embedded, have been developed by researchers at the University of Washington (Seattle, USA) led by Babak Parviz. These super contact lenses could offer the perfect platform for Augmented Reality: an important branch of computer science where computer generated images are super-imposed onto the real world; a technique which improves our perception of reality by allowing us to see interesting information that pops up as we look around. The effect is almost like having a sixth sense! Augmented Reality has recently started to become widely available thanks to new generation mobile devices. Smartphones, which embed digital compasses and video cameras, are able to calculate where the user is pointing the device and overlay data onto a scene accordingly. This hardware was the missing link to finally offer Augmented Reality applications to a wide audience. There is still a drawback though. Imagine if you walked around constantly looking at the real world through the screen of your mobile phone, your hands would always be busy holding the phone out in front of you and, in all truthfulness, you would look most peculiar. This is when the new contact lens, developed in Washington, comes into play. "An image projection system based on contact lenses offers an interesting platform for augmented reality," confirms J. Webster Stayman at Michigan Tech Research Institute (Michigan, USA), who has years of experience in the design of imaging systems. We could think about overlaying all kinds of images onto a scene: annotations, metrics, and virtual objects. Moreover, "since different images can be placed in either eye, it is also possible to do depth encoding for 3D objects," making the displayed virtual objects appear even more real. "All of this," adds Stayman, "can potentially be accomplished in a relatively small unobtrusive package that is already familiar to millions of people, such as a contact lens." 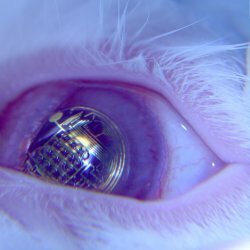 The new technique developed by the researchers at the University of Washington allows to place circuitry, including light emitting diodes (LEDs), onto contact lenses. "We are working on converting conventional contact lenses into functional displays," Parviz explains. "On this behalf, we have just demonstrated powering and controlling light sources on the contact lens through a wireless link." Biocompatibility tests. Contact lenses with electronic components were safely worn by rabbits for up to 20 minutes in laboratory tests. The new manufacturing process is based on a self-assembly technology, which allows electrical micron-scale components to lock onto their predestined locations on the contact lens without explicit human intervention. "This process does not require individual mechanical placement of the elements on a substrate. A process that, otherwise, would be extremely difficult and time consuming given the very small size of the electronic components," comments Stayman. The microelectronics industry is already capable of producing all kinds of micron-scale electronic subsystems, such as antennas, wireless data transmitters/receivers, display control circuits, optoelectronic display pixels, biosensors, etc. But the real challenge in this case was to integrate all of these into a functional system on the top of an unconventional substrate, such as the polymer that a contact lens is made from. The production of such contact lenses involves three main steps. First, a plastic template is created as a mould for micron sized metal contacts: this mould, on which the metal contacts are then coated, is created by digging guidelines into a plastic (PET) sheet using a photolithography process. Then the self-assembly step is quite simple: the plastic template is dipped into a special solution with some microelectronics components; thanks to capillary forces, the components then bind with the plastic templates in the desired location. Finally, the surface is encapsulated with a biocompatible material and pressed using a heated aluminum mould which imparts a permanent curvature on it, creating the contact lens. In the near future, then, should we expect to be able to wear a super contact lens wirelessly coupled with our mobile phone, similarly to a Bluetooth headset? Well, there are still a number of challenges to overcome before this scenario becomes reality. First of all, a high resolution display still needs to be embedded in the contact lens. This new technique is suitable for this purpose but "we are still at the beginning of this path," admits Parviz, "even if our manufacturing technique in principle allows for integration of a large number of pixels." There are also other technical issues to solve; most importantly, such contact lenses are likely to be restricted to display just transparent overlaying images. The reason is that we still cannot selectively block light from the scene to create an opaque overlay. As Stayman explains, "the lens is located, quite literally, at the pupil plane of the imaging system and overlaying images so close to the center of the eye would only change the optical response — i.e. blurring of the scene," like having a micro-spotlight just in front of your eye! So will it ever be possible to show opaque images on the contact lens? Stayman believes that "we could control the transparency of the entire contact lens," modifying the contrast between the overlaying image and the real world. Almost like turning down the lights a little bit. This would allow our eye to better distinguish the virtual objects displayed on the lens, switching the focus from the real scene on the background to the virtual annotation on the foreground. Finally, the most intriguing challenge is to understand how to deal with the constant movements of our eyes. "When we look at something we are constantly scanning the scene for content, with our eyes darting from area to area; this is because we use the fovea — the high resolution portion of our retina — for close inspection of scene content," says Stayman. "The contact lens will move with the eye. Thus to keep a virtual object or annotation fixed within a scene, the image displayed on the contact lens must be moved in a direction to compensate for the eyes motions. This would require some form of eye tracking device — potentially also in the contact lens itself. Such a tracking system would need to be quite fast and accurate for virtual objects to appear stationary." 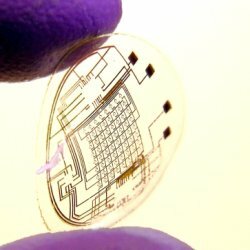 Considering these and other issues, it is still not completely clear how these contact lenses will be converted into fully working devices able to provide a good platform for Augmented Reality. Thanks to Parviz and his collaborators’ work, nonetheless, the day when we can simply blink and see all kinds of useful information popping up in front of our eyes might not be so far away. Christopher J Morris and Babak A Parviz, Micro-scale metal contacts for capillary force-driven self-assembly, Journal of Micromechanics and Microengineering (2008) 18, 015022 (link). H. Ho, E. Saeedi, S. S. Kim, T. T. Shen, and B. A. Parviz, Contact lens with integrated inorganic semiconductor devices, IEEE 21st International Conference on Micro Electro Mechanical System (2008) , 403-406 (link).